Are you newly pregnant or pre-planning for a healthy pregnancy and recovery? This is such an exciting but unknown time in your life. So many questions. So many resources for answers. It’s often a little scary when you’re trying to sift through all the advice out there to understand what you should and shouldn’t be doing to protect your growing baby but also to ensure your body is fit for carrying and delivering your babe. As a recent mom of two, and a physical therapist, I’d like to provide you with some tips to help you feel comfortable continuing with or starting a new program to keep you active during your pregnancy and guard against musculoskeletal pain and dysfunction before and after pregnancy. Do your best. This is obviously ideal but not always our reality. 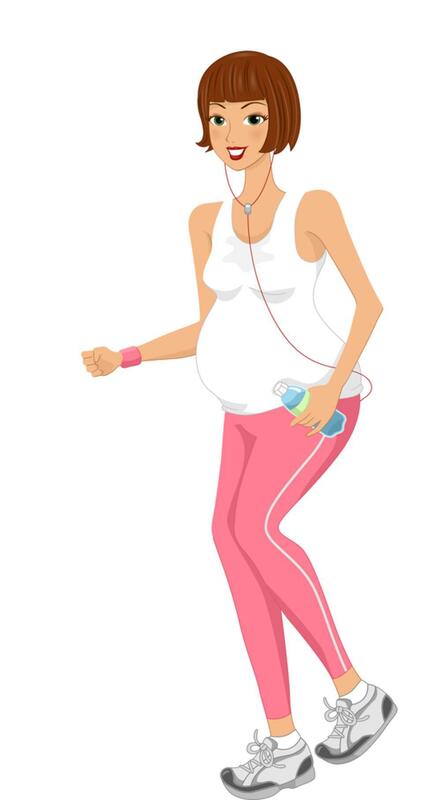 Once pregnant, get permission to exercise from your doctor prior to beginning or continuing with an exercise routine. Regularly check in with your doctor as your pregnancy progresses. As long as you have a low-risk pregnancy with no contraindications, such as high blood pressure or symptoms of premature labor, exercise is good for you!! Exercise can help you increase your endurance, reduce risk of gestational weight gain and diabetes, reduce stress and anxiety, increase energy, help you sleep better, and even make you feel better about yourself. 3. Listen to your body and don’t be afraid to modify your routine on a daily basis. What you used to do pre-pregnancy might not work for you anymore. What you did today might not work for you tomorrow. Your body’s response to exercise during pregnancy changes—changes in heart rate, ventilation, and energy expenditure are all greater while pregnant. Generally speaking, if you were exercising regularly before getting pregnant you should be okay to continue, adjusting accordingly. But, if you’re starting a new routine you may need to be careful and start off slowly. 4. Recommended pregnancy exercise routines!! Strengthen your pelvic floor and focus on your core: In preparation for delivery your body releases hormones which cause your ligaments to relax. This is one reason why you need to make sure you have adequate muscular strength and neuromuscular activity to provide dynamic support to your joints as you move through your pregnancy. Kegel exercises should be done regularly throughout the day. Do them while sitting at a stop light or standing in a checkout line. Nobody will know!! Try 10 reps holding for 10 sec at least 3x/day. Time to throw out the old crunch routine and start to strengthen in a neutral spine position. After the first trimester some women will be advised not to lie on their back. There is new research on this and some doctors still support that theory while others do not, so check with your physician and make note of how you feel when YOU lie on your back. Based on this, you may want to avoid doing exercises lying on your back or curling forward—think PLANKS! There are many variations of planks and as long as you’re being careful not to strain your back you should be fine. Try an incline plank with hands or forearms braced on a sturdy coffee table. Squeeze your thighs together and do a Kegel while maintaining the plank position to engage more of your pelvic floor. 30min/day of moderate intensity activity on most, if not all, days of the week is recommended by American College of Obstetricians and Gynecologists guidelines. Build up to this if you’re not already an active person. American College of Obstetricians and Gynecologists recommends that pregnant women use the “talk test” when exercising—if you can’t talk normally, turn down the intensity. Examples of low impact activities: swimming, walking/jogging/hiking, dancing, modified aerobics. United States Health and Human Services guidelines indicate that “when beginning physical activity during pregnancy, women should increase the amount gradually over time. The effects of vigorous-intensity aerobic activity during pregnancy have not been studied carefully, so there is no basis for recommending that women should begin vigorous-intensity activity during pregnancy”. As a general goal, try to maintain a reasonable level of fitness rather than optimizing it. Exercises should feel good and not overly strenuous or taxing on your body. Base your program on your current level of fitness. Don’t do resistance training on consecutive days and generally 3d/wk incorporating a full body workout is adequate and ideal. As always, proper form with all exercises is a must! As mentioned previously, focus on your core and proper alignment, but then go ahead and do squats, lunges, lat pull-downs, bicep curls, triceps extension, TRX training using your own body weight for resistance, modified dead lifts, etc. Avoid all sports involving risks of falls, trauma, or contact/collisions. No downhill skiing, skydiving, mountain biking, or contact sports. Adjust intensity of exercise in high altitudes or extremely hot weather. Drink lots of water! Signs and symptoms to stop exercise: dizziness, difficulty breathing before exertion, vaginal bleeding or amniotic fluid leakage, increased or new abdominal or back pain, decreased fetal movement, preterm labor. 6. If you have questions—ask your physical therapist!! It’s better to address questions, musculoskeletal pain, or movement dysfunctions before and during pregnancy than waiting until after your baby is born for many reasons! One, having time to take care of yourself once your baby is born will be limited. And two, the demands of increasing weight gain, joint laxity, postural changes, and labor (obviously!) are taxing for your body and minor issues can lead to bigger problems as time progresses. Physical therapy can help with many common pregnancy related issues like low back pain, sacroiliac joint pain, or helping to manage symptoms and improve function for those with Diastasis Recti (when the 2 sides of your abdominal muscle separates). Physical therapy can also help with postpartum complications like pain and muscle imbalances from carrying and handling your infant, incontinence and pelvic floor dysfunction, and basic strengthening and retraining for your core to improve posture and aide in transitioning back to your normal daily routines, including work and/or recreational activities. If you are reading this I’m guessing you or a loved one is pregnant or planning to be. I hope this helped give you a guideline for how to safely exercise throughout your pregnancy. Again, make sure to get cleared by your doctor before following any program. From personal experience, regular walking seemed to make the most sense for me. I was terribly nauseous for almost my whole pregnancy both times but getting outside in the fresh air and getting my heart rate up made a huge difference. Find what works for you and keep moving!! Written by Naomi Schambelan, Physical Therapist at Lafayette Physical Therapy, Inc.